Sometimes, you come across a group of photographs that give you a new perspective on something you think you know reasonably well. Such is this group of photographs, which I stumbled across on Flickr a day or two ago. 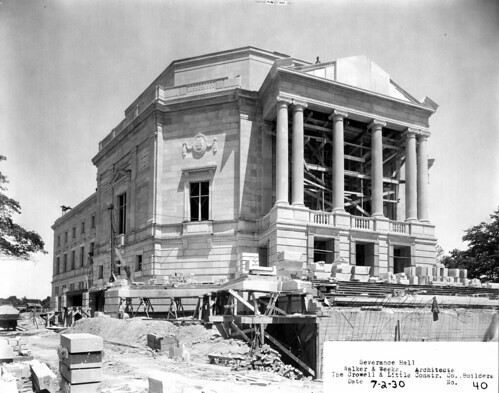 Their subject: Severance Hall. This group of 54 black and white photographs comprise a bound volume, Severance Music Hall, held in Special Collections at Cleveland Public Library. Walker and Weeks, the architects for the building, are listed as the authors. 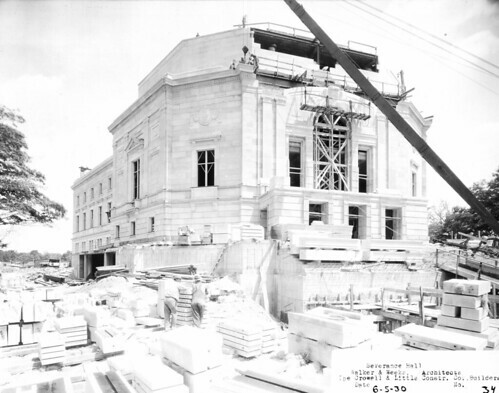 The volume illustrates the construction of the structure, from excavation of the foundation, in November of 1929, to the completion of the basic structure, in August of the following year. It does not extend, alas, to the finish work or interior details - but there are plenty of photos elsewhere of the glorious interior. Here, looking south, we see the vacant lot where Severance Hall will be built. It appears that the excavation of the foundation has already begun, yet some debris remains to be cleared. 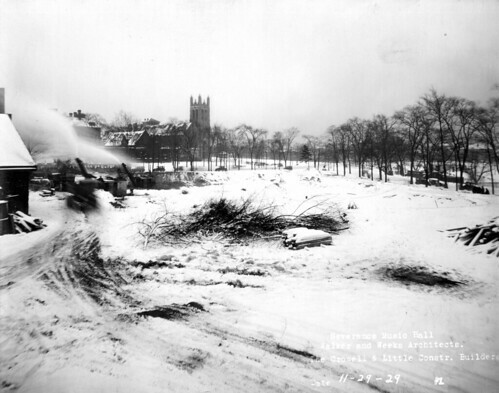 In the distance, slightly to the left of center, is Amasa Stone Chapel, completed in 1911. Looking across the site to the north, we find a site very different from what is present today. Behind the trees to the left, in the distance, is the Cleveland Museum of Art. On the right are two structures - what I believe to be present-day Thwing Center. The top of the tower of the Church of the Covenant is visible in the distance. The set continues with the excavation of the foundation and the first pieces of structural steel, shown from two perspectives. 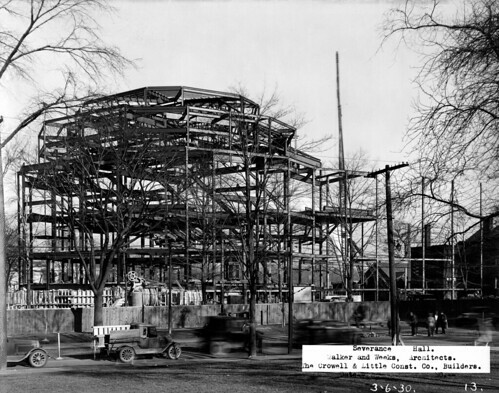 The construction progresses to this image, dated February 20, 1930. 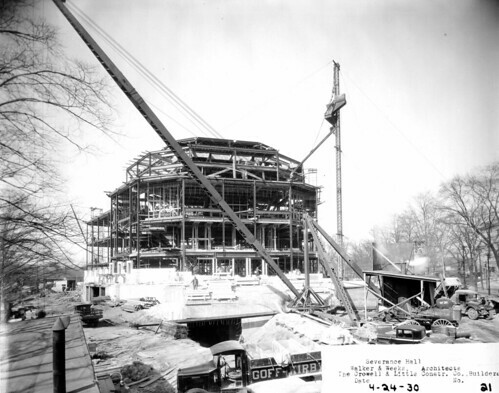 For the first time, we see the basic shape that we know as Severance Hall. It surprised me how early the shape of the structure was recognizable. 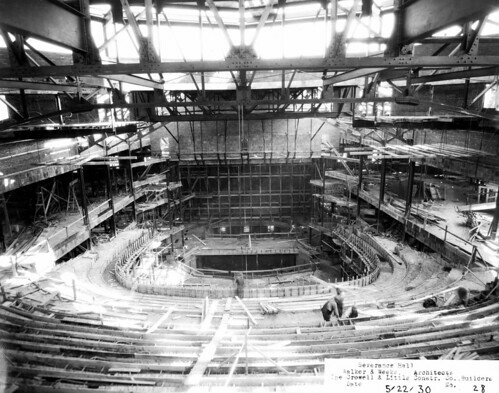 The photos also document the building of the interior. 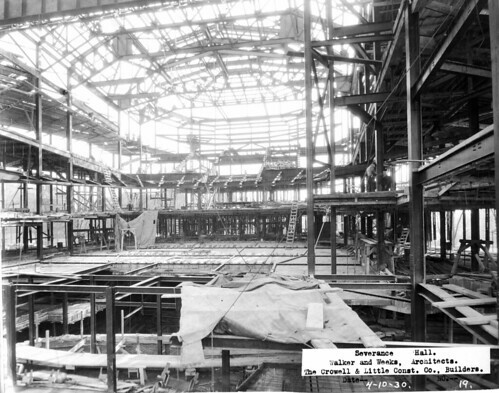 The form of the main hall can be easily visualized within this steel framework. At first glance, the photos appear almost like snapshots. Then, you realize that, if so, they are very lucky snapshots. Closer examination reveals real care in composition - and the clear use of a view camera, revealed in the carefully aligned verticals in many of the images. Take this exterior view. The photographer clearly considered the composition quite carefully. Further, while some parts of the print are washed out due to the bright sunlight, the general tonal quality suggests that effort was put into making a high quality print. There's a surprising amount of beauty to be found here. 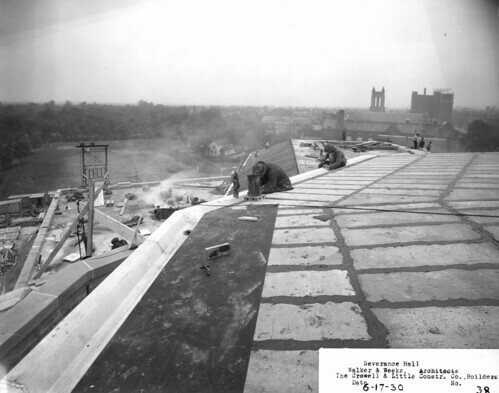 A view of work on the roof, dated June 17, 1930, seems a change in style from the vertical emphasis of so many of the rest of the photos. 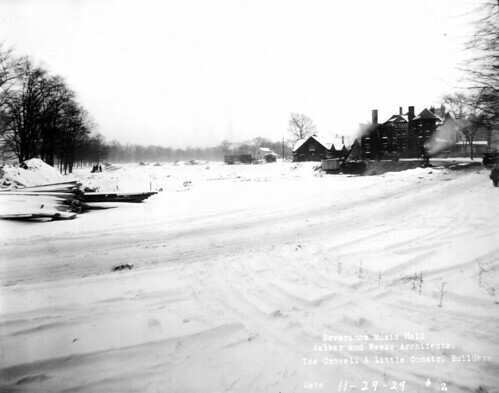 In the distance, to the right, the Church of the Covenant is visible, as is the apartment building at the corner of Ford Drive and Euclid Avenue. The exterior work soon progresses to a form that appears, at least from the outside, to be almost complete. I'll close with one final photo, taken out of sequence. The sun, low in the sky, provides a beautiful source of illumination for this photo. 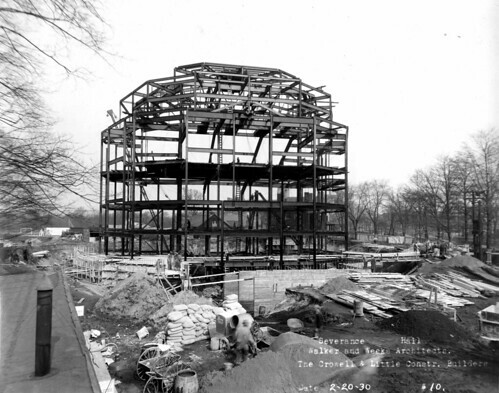 If you just look at the steel framework, you might think that it was a recent construction project. The workers' trucks and the nature of the construction machinery are the only things that give away the date. It seems, in a way, not dissimilar from the scenes that I've witnessed in the construction around the VA Hospital. This set of photos is both a beautiful set of images and a valuable historical record - something that's worth looking at in its entirety. 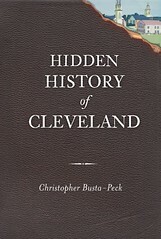 I give my thanks to the librarian who scanned the photographs and to the Special Collections Department at Cleveland Public Library, where the volume is preserved. It hints at the wealth of material available contained within the collection, available to whoever might venture downtown and ask. Bravo! Lovely set you got there. Really enjoy the final one!